As part of Montgomery County ’s Technology Corridor, the Twinbrook neighborhood presents a great opportunity to create a distinct community featuring a mix of homes, jobs, stores and businesses. The Twinbrook Sector Plan envisions an attractive community that benefits from state-of-the-art design, a pedestrian-friendly environment of sidewalks and trails, and green, sustainable features. New urban parks and pedestrian-friendly sidewalks and paths. The Maryland-National Capital Park and Planning Commission took final action to approve the plan on January 21, 2009. The action followed the County Council's review and approval of the plan, which occurred on November 18, 2008 (at which time council members also approved the TMX-2 Zone and the I-4 Amended Zone). The Twinbrook Urban Design Guidelines (5.4MB) make specific recommendations for streets, open spaces and buildings within the Sector Plan. View the basics of why we draft sector plans, what they include, and the major issues addressed in the Twinbrook plan. 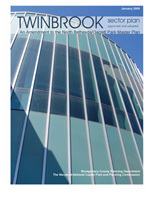 Learn about development in Twinbrook in this January 2013 walking tour excerpted from our Montgomery Plans cable show. Discover the origin of Twinbrook's name, its founder, and other significant historical milestones. M-NCPPC Commissioners took final action on the plan on January 21, 2009. The Montgomery County Planning Board approved MCPB Resolution No. 09-02 and voted to transmit the Twinbrook Sector Plan to the full Commission. (January 8, 2009). The TMX-2 Zone and the I-4 Amended Zone were approved by Council. (November 18, 2008). Staff presents sector plan draft #1 to the Planning Board. (June 21, 2007) View staff presentation.